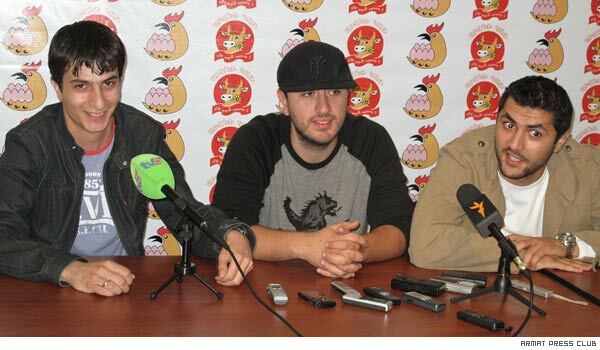 Bad boy rapper Misho thinks his recent bickering with a former rap partner has been the second major topic in recent days along with “Armenia-Turkey rapprochement”. Misho (real name Miqayel Abrahamyan, 27), and the other young rapper Hay Tgha (HT) Hayko (real name Hayk Margaryan, 24), have gone public to say they leave their quarrels behind. The rappers, who enjoy mega popularity among teenagers, declined to answer any more questions regarding the quarrel that they said had become “the talk of the town”. Misho, on behalf of both, delivered an official statement. “We officially state that everything between Hayko and me is fine, every problem is settled and we would want to call on the people not to try to gain advantage in such issues, since, after all, people should appreciate what we do, and not speak about what relations I and Hayko have,” said Misho. It transpired that two weeks ago the relations between the two rappers, who began their rapping career in the same group, dramatically worsened after HT Hayko “rap”-criticized Misho in his Quansh Part 2 song in the CD called Quansh. In the song that has two versions, as the majority of their songs do (with and without foul language), HT Hayko gets angry at Misho who said that “there is no rap in Armenia apart from “Ape jan” (a group of two American-Armenians rapping in English) and “Hay Team” (Misho’s group).” In the song HT Hayko also called Misho “a puppy”. The songs provoked widespread discussions in online forums where the fans of the two singers traded curses and accusations. The rappers also said at the press conference that their reconciliation is not a publicity stunt to raise their rating. “Many think we did all this to make ourselves even more popular. It’s a lie,” said HT Hayko. And Misho, for his part, added that they put their self-esteem first and would not do such a thing just for PR. In the end, both showed their middle fingers to all those who dreamed and continue to dream that such a thing happened.